Landa Mobile Systems LLC protects the ownership of Gin Pole ownership and all transfers. We store copies of all records from day one of manufacture in the cloud and document replacements available for the life of the pole. Sold a pole let us know, we track owners and serial numbers for many reasons including theft. Thieves can never get the pole recertified and new load charts without a bill of sale. Landa Mobile Systems LLC delivering gin pole to client for Repack HD antenna work. Repack begins and the poles are coming out to fill the void, since most earlier production poles miss the mark with the original production documentation now required to be certified. I am sure there are going to be folks that try and get buy, but the fines are steep. As the repack begins so the demand for legal gin poles begins the saga. This pole is heading out to new owners GTI America Inc out of Buffalo, NY. 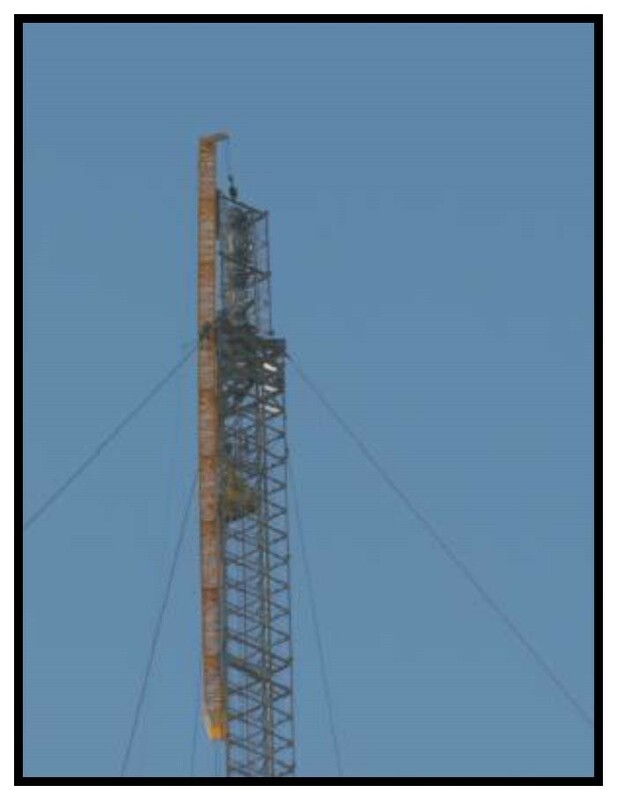 They are doing work on a 900′ antenna tower in Claremore, Ok and then heading up onto a 1600′ tower in LA. This is our LMS PS24 jump track square gin pole for those large tower projects. We have them larger as well to fill you needs for any lift. Landa Mobile Systems LLC gin pole at work. We continue to deliver the quality and safety built in gin pole. One of the most popular poles is our LMS PT18 Ginpole shown here in use. Proudly we can say we have never had an accident involving one or our gin poles in use around the world. You cannot find a better pole than the Landa Gin Poles. Manufactures for tower installations, tower modifications and repack. We also build poles for water tower deconstruction as well. Landa is looking in the future to start producing sky scraper crane units used to build buildings you see in use in the skylines of every city around the world..
Customers wanting the GP30 Gin Pole with its roller end and rooster head coupled with the ability to transport it in shorter lengths. The solution is here the new GP 30 HC Gin Pole. 3 section slip joint for Hand Carry transport, GP30 3 PIECE is excellent for taking up in an elevator or carrying into remote areas. Tower works Inc utilizing our LMS PT 18 Gin Pole they purchased a few years ago. We received photos from Eddie the owner showing their erection of a Union Pacific railroad Waterloo Illinois. “Tower works incorporated putting up identical tower and microwave to replace old tower 260′ using a Landa made gin Pole top notch poll” Please send us your photos and the success stories as towers come to life, receive a modifications. repaired or dismantled. Landa Mobile Systems LLC Gin Poles ae designed to last a lifetime if taken care of. LMS PT-12 50′ GIN POLE built in February of 2014, in for inspection. Pole looks like new. In excellent condition. Absolutely no rust and very little cosmetic blemishes from use. Metalized finish has kept this GIN POLE looking like new and proves to be a winner. Yet another attestation of the quality product that Landa Mobile Systems, LLC produces. Nice complement from client today, nice to hear from happy customers. As springs pickup up momentum our Gin Poles are heading out the door. Gin Poles are becoming a part of many companies inventory. Tools that will be providing years of safe installs. We appreciate the business as Landa Gin Poles become a common name for quality in the tower industry. LANDA MOBILE SYSTEMS, LLC has been a member of nate for many years in the past. Gin Poles while having an extra steel plate welded to them for jump track use does not increase the weight lift capability of the pole since the plates are welded on the back of the pole. The compression on the front (or outside legs) of pole has no additional support and is the most critical of the unit in design. 3 section slip joint for Hand Carry transport, GP20 HC POLE IS 20′ LONG Pole is excellent for taking up in an elevator or carrying into remote areas. We have been receiving requests for parts on gin poles that do not meet industry standards and we will not offer support for other poles not having the required documentation. NEVER RENT A GIN POLE OR WINCH; REASONS WHY. Make sure if you rent a pole its just had and inspection and a mag particle check to protect your company and crew from hidden defects from prior rentals. Renting a pole is like borrowing someones tooth brush, you dont know what your getting. We have heard of companies sticking their necks out there providing rentals of these critical items. Use extreme caution and ensure you have all documentations needed to have on site. Ask us and we can advise what you need. We do not rent the aforementioned. We are offering allowing caller to give serial number of pole and obtain a history and copies of all inspections and build certificates. Copies of the current Load Charts and we will not provide information to unregistered owners. We track gin pole ownership and in case of theft your protected we will not provide docs. All Gin poles sold will now be shipped in export wood crates. As of this date 32% of all gin poles sold in the past five years have current load charts and in inspection. 68% have expired load charts, 64% are out of inspection. We cannot assume the liability and provide inspection service on Gin Poles manufactured by others. Inspections and engineering evaluation can be performed according to TIA-322 in accordance with ANSI/ASSE A10.48. When it comes to reliability our poles provide a secure alternative method vs the expensive crane. Yes it takes the skill of a trained professional company with experienced crews that knows their business, and how to get the job done safely. LANDA PUBLISHES NEW LOAD CHARTS FOR THE FAMOUS LMS GP30 GIN POLE. The GP30/20 Gin Pole New charts allow the pole to be used in 30′ length or 20′ allowing the flexibility of two poles in one great unit. Easy to transport and the metalized finish affords the user a much safer finish similar to 80 grit. When holding on is critical the finish is there for your safety and longevity in the field affording the operator years of maintenance free operations. Load charts on all gin poles are good for 1 year only and renewable annually with confirmation of re-certification. Pole manufacturing documentation is stored in the cloud for retrieval years down the road and tied to the serial number for life. CODE ELECTRICAL, LLC GETTING THE JOB DONE WITH THE LMS PT12 GIN POLE. As the crew makes short order of putting the top of this tower antenna array together the PT12 with the metalized surface and ease of handling make the day much more profitable for the operator vs. crane. LANDA INTRODUCES TOW NEW DESIGNED RE_PACK GIN POLE FOR THE UPCOMING 2018 RE_PACK. Our new Gin Pole the LMS PS 20 Re-Pack Gin Pole comes in 123′ and 143′ length, being a square pole with 20″ face, track pole with the ability to safely pick 13,250 lbs. Pole comes in 7′ -10′ and 20′ long sections and fit in an elevator to take up to the top of a building. The big brother theLMS PS 20 HD Re-Packcomes in 123′ and 143′ length, being a square pole with 20″ face, track pole with the ability to safely pick 16,020 lbs. Pole comes in 7′ -10′ and 20′ long sections and fit in an elevator to take up to the top of a building. Daniel Gagnon P.Eng., Ph.D. with Hydro Quebec is bringing back the Gin Pole into power line transmission tower work. Daniel States “We have a need to reintroduce the use of the gin pole technique in our power-line construction division. We used it 25 years ago but had switched to crane operation. Do you know of power-line construction companies in the US and Canada that use the gin pole to build power-lines ? Also, any organisation in the US or Canada that train linemen specifically for this technique ?” We welcome them to the Landa Gin Pole family and introducing them to LMS Safety for training and a few of our operators in the industry. We look forward to working with Canada introducing our gin poles into their power program saving them thousands of dollars in deployment costs while maintaining our safety standards maintaining the history of our products without an accident ever. LMS PS20 RE-PACK is the model number and 123 and 143′ long pole, 70′ of track and use able in many lengths. Pole has a 20″ face and will pick one huge (12,230lbs / 5547 Kg) load safely. Go take a look at the specs for pick and will be manufacturing one with 7′ section lengths to fit in an elevator for the high building servicing. The pole will also come in 10′ and 20′ sections for ease of operation and flexibility. Gin pole load charts effective this date will have an expiration date matching the pole certification inspection date. Poles manufactured prior to ANSI/TIA-322 need new Re-cerfification, inspection and load charts. We offer new Engineer stamped Load Charts noting the applicable pole serial number, after inspection and the cost for new charts is 250.00 for July only, new load charts will then be 450.00. OSHA REQUIRED FORMS WE SUPPLY WITH GIN POLES WE MANUFACTURE. LANDA HAS COMPLETED AND REVISED OUR COMPLETE LINE OF GIN POLES WITH NEW ANALYSIS OF ALL POLES. As the USA Gin Pole premier manufacture our poles are guaranteed in meeting the new industry standards. Sample Load charts are posted on each model gin pole web page spec. sheet. Please note all load charts are all pole specific with applicable build serial number and now have an expiration date the same as the pole. Safety LMS Tower erection hoist operations coarseThis is a one day course which includes one full day of classroom instruction and a final exam. The Gin Pole course is a clarification of the TIA-PN-4860 Gin Pole standard for “Design and Use” and as referenced by the OSHA Directive CPL-1.36. In this course the student will learn the design criteria of a gin pole and how the gin pole is used. Landa now produces a new 20′- 88lb aluminum lightweight designed version of our popular steel gin pole for operations where hand carry is the most economical way for deploy and erect safely towers in the Jungles of Central and South America, as well as difficult access areas. They will be useful for many other types of operations and look forward to another safe year maintaining our history of accident free going on 5 years. Thanks to all the effort of Nate and Safety LMS in training and keeping workers educated and safe. Tower being serviced utilizing our new LMS GP20 HD Gin pole. The new metalized heavy duty pole built to meet the rigorous demands of today’s loading and engineering safety. Load carts are not interchangeable to same model numbers as older models. There are differences and New Load Charts supplied are pole specific and have an expiration date.